My son-in-law: "What would make it worth your while to drive a U-Haul truck from Klamath Falls to our new home in Detroit?" Me: "I'll do it in exchange for a first-class train ticket back home." 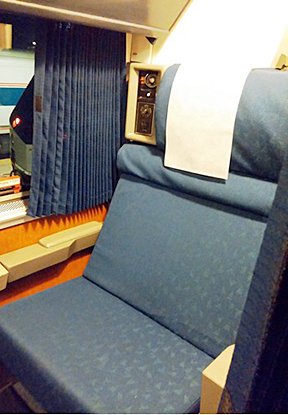 A rail trip, with overnight stays in a roomette, had been on my wish list for a long time. Now, at last, after the U-Haul adventure, I was looking forward to spending four days and three nights aboard Amtrak—a first for me! The well-maintained Detroit Amtrak station opened at 5:00 am. The Wolverine's ride to Chicago was fast and smooth, with views of the verdant Michigan and Indiana countrysides. Lake Michigan appeared briefly near Gary, Indiana, as the train passed long-idled steel mills. At Chicago's Union Station, I checked into Amtrak's nicely-appointed Metropolitan Lounge for sleeping-car passengers. Before the 2:30 pm departure of the Southwest Chief, the Lounge overflowed with passengers, exceeding the available seating. I made my way along the platform, inside the cavernous and noisy maze of tracks, to the proper Superliner Sleeper—a roomette on the upper level. Inside, it was comfortable and clean, but there were water spots on the outside of the window glass. The camera in my Smartphone preferred to focus on those instead of the distant scenery. As the Southwest Chief departed Chicago, my sleeping car attendant popped in to welcome me aboard, introduce herself, and explain the amenities of the roomette and sleeping car. Crossing the Mississippi River at sunset we entered Iowa. The train's rocking motion increased. Walking became difficult. Roller coaster track became the norm for the bulk of the trip. At dinner, I chatted with a couple from Florida and enjoyed a nice dinner salad, delicious Flat Iron steak, and cheesecake. While I was in the observation car, the attendant prepared my bed. This left little room within the roomette. Changing into night clothes while the train was swaying and rocking was a challenge. The upper bunk was a handy place to stow my suitcase. Once in the lower bed, I was comfortable and cozy. Sometimes the train lurched as it negotiated rough track. I have a hair-trigger reflex and was startled awake several times by the roar of locomotives hurtling in the opposite direction. Otherwise I slept all the way across Kansas and awoke just before sunrise. After dressing and performing morning ablutions, I went to the dining car and was enjoying a breakfast of scrambled eggs, French toast, fried potatoes, and orange juice as we slowed for our station stop at Lamar, Colorado. 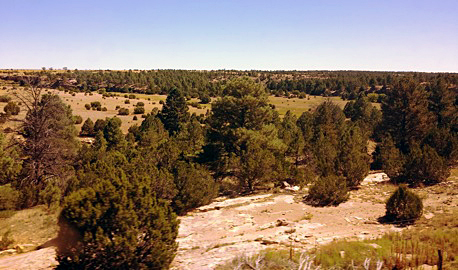 Near Trinidad, Colorado, the terrain began to transition from flat, barren land to small hills. The public address system announced: "We have a red signal and must await clearance from the dispatcher before continuing." After a few hundred yards, another announcement: "A bridge has to be inspected before we cross it." Stopped on a curve, I could see the bridge; it was about six feet long. The conductor walked ahead to it, peered under it, then inspected the other side before radioing the engineer that it was safe. Everyone was greatly relieved. We crept on until clearing the next signal. Our next stop was Raton, New Mexico; we went through mountainous territory as curving track slowed us down. The tracks straightened out on the flat land between Raton and Las Vegas, New Mexico. We were soon up to speed. Along this section it was a treat to see semaphores. These are some of the last remaining semaphore signals in use on any mainline railroad in America. The terrain changed, with rock outcroppings at the many cuts we traversed. There is a stark beauty to New Mexico’s scenery. 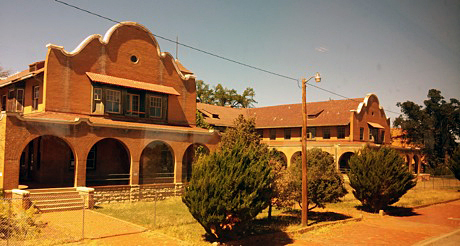 At Las Vegas, New Mexico, the former Harvey House stands in all its glory, albeit enclosed by a chain link fence. The building, which dates from 1898, is being renovated and will become La Castaneda Hotel. The high desert scenery was breathtaking. I took it in while lunching in the dining car, having a conversation with a couple who were with an organized tour.They planned to detrain at Flagstaff, Arizona, then explore the Grand Canyon. Albuquerque was a service crew change stop. Locomotives were refueled, passenger cars serviced, windows washed, and the train inspected for defects. Passengers detrained to peruse tables of hand crafted jewelry, blankets, pottery and trinkets for sale by Native American vendors. 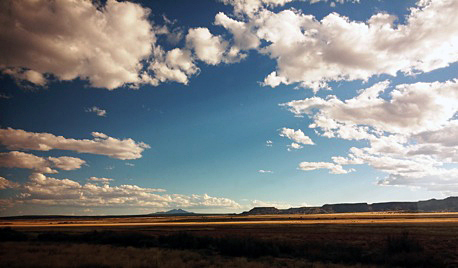 The scenery of New Mexico continued to impress, with wide vistas and picturesque cloudscapes. It was dark when we stopped in Winslow, Arizona. I began to try my hand at converting my seats into a bed, not wanting to bother the attendant. I was accosted by an unfamiliar attendant who asked, "What are you doing?" "I decided to prep the bed myself." “No, no, no!” she said. “I’m supposed to change this room for someone getting on at Kingman! Let me see your ticket!” She looked it over, peered back into the corridor, and exclaimed sheepishly “This isn’t my car!” Turns out she was actually the attendant for the sleeping car behind us! We had a good laugh. "I’m glad that even crew members sometimes get confused; I thought it was just me!" I said.The errant attendant finished making up my roomette. "It's the least I can do to after scaring you like that!" I slept better this second night, only awakening briefly when the train stopped in Kingman, Arizona, and again at Needles, California.The next time I awoke, we were slowing for our station stop in Riverside, California, one hour behind schedule. The scenery changed dramatically. Passing backyards, business areas and graffiti, there were discarded mattresses strewn along the right of way. After a stop in Fullerton, we arrived in Los Angeles only about 15 minutes late. It took me awhile to locate a sign to the Metropolitan Lounge. Once again, its popularity exceeded its seating capacity. It was standing room only. I found a convenient pillar to lean against which pretty much kept me out of anyone’s way. Since I’d not had breakfast on the Southwest Limited, I enjoyed a complimentary muffin and coffee in the lounge.The Southwest Chief dining car had closed upon departure from Riverside so the crew could attend to their duties before arriving at Los Angeles. I would have imagined that the duties of a dining car crew would be to serve breakfast to their passengers, but I suppose Amtrak must have a good reason for this. 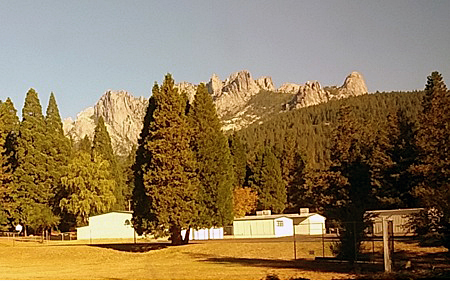 I was in Roomette 10 in car 1431 as the Coast Starlight departed at 9:30. 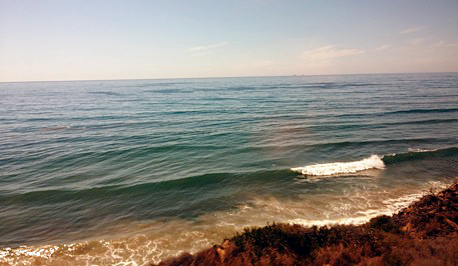 Soon we were tracing the coastline and watching the waves of the Pacific Ocean. Here’s a tip for rail travelers—don't rely on your cell phone to take pictures. There was enough delay between pressing the virtual shutter icon to when the photo clicked that I ended up with a lot of pictures of blurred telegraph poles. After lunch in the dining car, I repaired to the Pacific Parlour Car, reserved for first class passengers. We arrived at Salinas, 20 minutes late. Two of my old high school classmates, Jon and Pat joined me for quick reunion on the platform. After sunset, north of San Jose, I drifted off to sleep. When the train stopped at Emeryville, the public address system told us: "A freight train ahead of us struck a trespasser. We'll be stopped while authorities investigate and clean up." 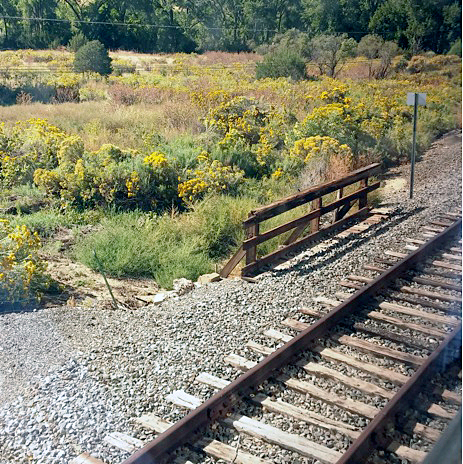 I awoke when the train stopped in Martinez with a railroad crossing signal chiming and flashing outside my window. Our train service crew had run up against their maximum legal work hours so we had to wait for a replacement crew. When we finally started rolling, we were four hours late. We made a quick stop at Sacramento. I drifted off to sleep until we stopped at Chico, six hours late. The old adage of “a late train gets later” was proving true for this trip. But I really didn’t mind… I do enjoy being on a train! My breakfast tablemates were a woman from Hawaii and a couple who were traveling to Seattle to board a cruise ship. We arrived at Redding five hours late. The ride north through the Sacramento River Canyon to Dunsmuir, usually passed at night, was beautiful. Castle Crags was brilliantly illuminated at sunrise. At the city of Mount Shasta we made an unscheduled stop, as this crew had also run out of legal working hours.The new crew from Klamath Falls was waiting for us, so the stop took only ten minutes. 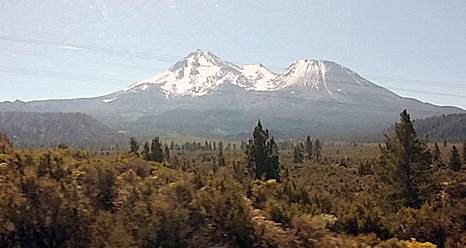 In the Pacific Parlour Car, I had a pretty good Italian sandwich while watching the ever-changing vistas of Mount Shasta, usually seen at sunrise when the train is on time. We arrived in Klamath Falls at 12:44 p.m., four and a half hours late. I enjoyed the trip, but was glad to be home. Next time, I’ll bring along a REAL camera!